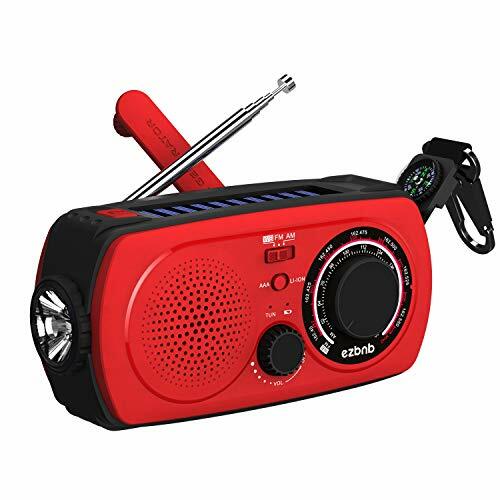 A Must For Emergency - Multifunctional AM/FM/SW/NOAA weather alert radio with 3 LED flashlight, smart phone charger and alarm clock, broadcast emergency weather alerts for your area such as hurricanes, tornadoes and severe storms. NOTE: Please don't crank the radio when Lithium battery is not installed or insulation tab is not removed! 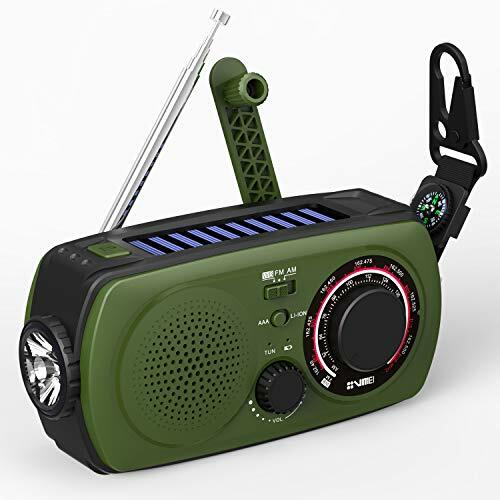 Alarm Mode With LED Flashlight - With Alert standby function, the radio will be silenced until there is a weather statement, watch or warning when you enter the Weather Alert Mode. Built in brightly flashlight for emergency and survival situations to light up dark spaces and areas or to keep your room nice and bright. Multiple Ways to Charge - AC(not included), DC, Solar, Hand Crank, 600mAh Rechargeable Lithium Ion Battery, 3PCS AAA batteries(not included); It can be charge USB port devices such as smart phones, to keep you connected and powered. If the radio is on, it will turn off and go into charge mode. 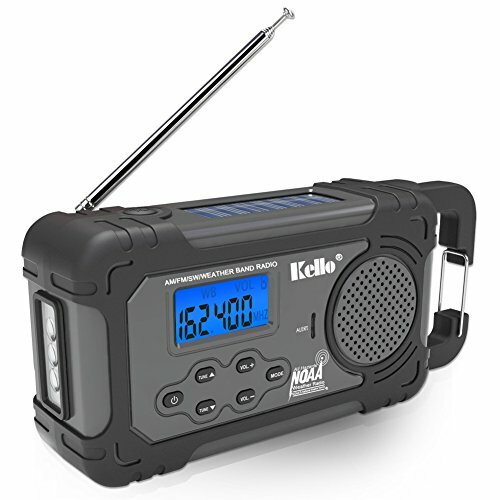 High Performance - Kello's Radio has an excellent loud and crystal clear speaker. The volume is loud enough for a group of people to hear any station during heavy rainfall or a severe thunder storm. Comes with an AUX input, you'll be able to connect a headphones and stay connected anywhere at any time. Enjoy Life Outdoors - Keep this AM/FM/SW & NOAA weather radio with your family, get up to date with the latest weather and all hazard information for your area! 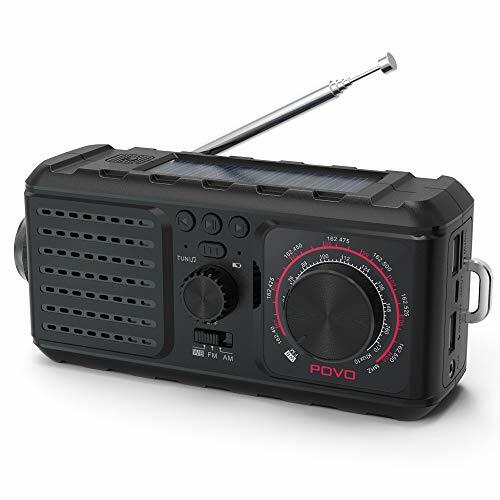 Ideal as a home radio and an essential part of emergency kits, survival kits, bug out bags etc. 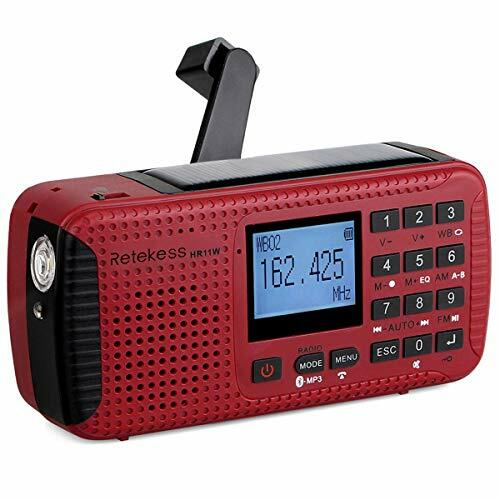 Multifunctional AM/FM/SW/NOAA weather alert radio with 3 LED flashlight, smart phone charger and alarm clock, broadcast emergency weather alerts for your area such as hurricanes, tornadoes and severe storms. The main chipset in radio is made by a leading US supplier makes the radio reception superior. With Alert standby function, the radio will be silenced until there is a weather statement, watch or warning when you enter the Weather Alert Mode. Can be powered by 4 ways. 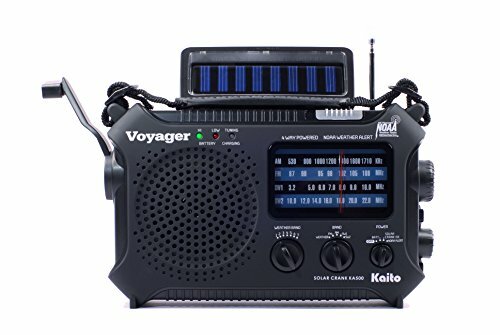 Ideal as a home radio and an essential part of emergency kits, survival kits, but out bags etc. 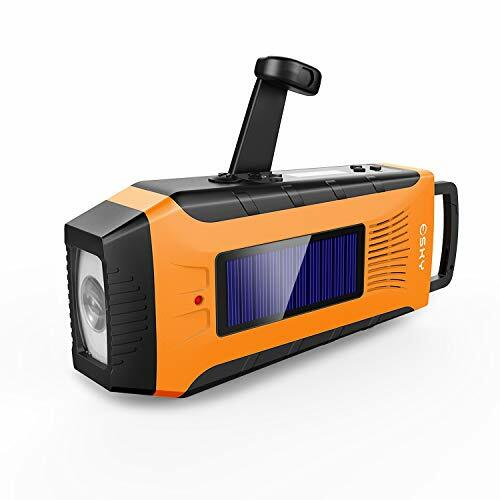 Emergency Weather Solar Hand Crank Portable Radio-VMEI NOAA Weather Radio with AM/FM,2300mAh Power Bank USB Charger,Flashlight,SOS Alarm.for Household and Outdoor Emergency Device(Green). VMEI Weather radio: This AM/FM & NOAA weather alert radio, broadcast emergency weather alerts for your area such as hurricanes, tornadoes and severe storms. SOS Alarm With Flashing Light: Ask for help in case you have an emergency or you want to warn somebody. Four ways of the power : You can choose 2300mAh rechargeable Li-ION battery or 3 AAA Batteries. hand crank generator and solar panel can charge the 2300mAh battery. Don't worry about the problem of no power. 2. Wide range of reception: 7 NOAA Weather channels and AM/FM/SW1/SW2, you can get real-time weather forecast and other breaking news, including hurricane, earthquake, flood, tornado, thunderstorm, and other warnings. 3. Better entertainment: Support Micro SD card (excluded) work as a MP3 Player, and too many sports, talk-shows to listen. Great for indoor and ourdoor, Camping, Hiking, Boating and other kind of travel. 4. SOS Alarm and Portable: Loud Alarm; Convenient Lantern handle ,extremely portable. With 5 Leds Flashlight, 8 Headlamps, enought to use in any place. Bigger size 7.9*5.1*2.6" . 5. High capacity: Built-in Li-ion 2300mAh power bank for iPhone X / 8 / 8 Plus / 7 / 7 Plus / 6 / 6 Plus / 5s and Galaxy S9 S8 Plus, S7 Edge, Note 8 5, J7. Can be charged by micro usb port, hand crank and solar panel. Support BACKUP 3 x AA battery (excluded). 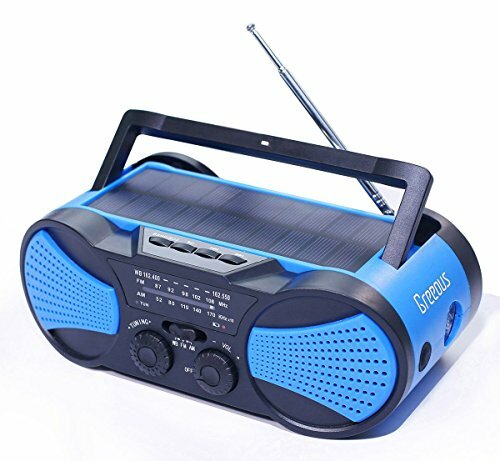 It is used as a Weather radio, can't work as a professional solar power bank. 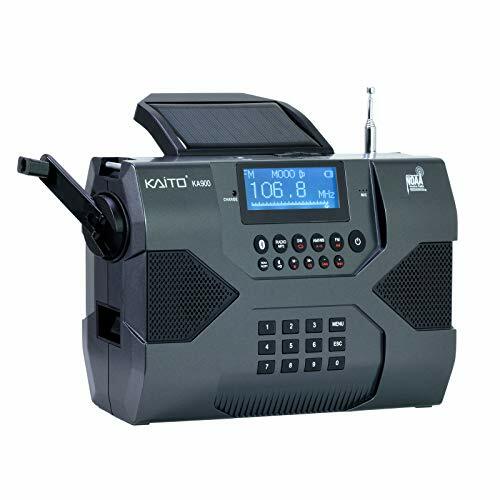 MULTIPLE POWER SOURCES - The ER210 features 3 sustainable power sources to recharge your radio: Solar Panel, Hand Crank, & the Rechargeable 2000 mAh Battery. SOLAR PANEL - Recharge the internal lithium ion battery with direct sunlight. 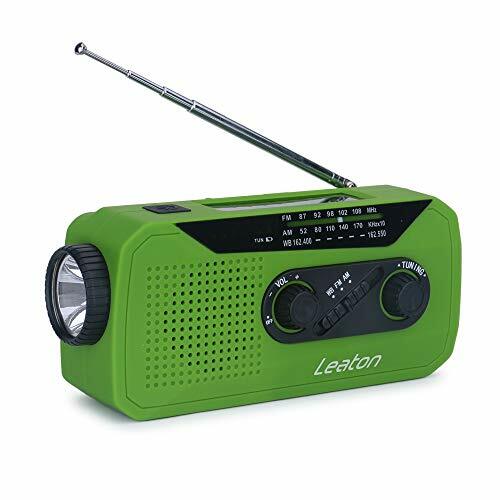 HAND CRANK - Recharge the radio during a power outage or anytime away from a power source. 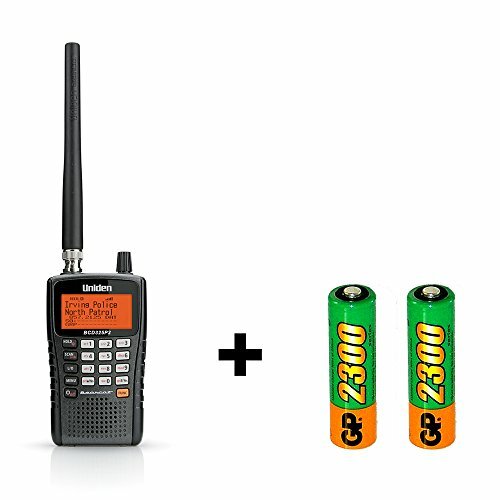 RECHARGEABLE 2000 mAh BATTERY - The replaceable long life lithium ion battery provides up to 25 hours of radio operation. EMERGENCY FLASHLIGHT - The SOS FLASHLIGHT BEACON flashes Morse code in an emergency scenario and the Bright CREE LED (130 Lumens) can be used to signal for help. Select the Low brightness setting to conserve battery life or the High brightness setting for maximum illumination. NOAA WEATHER SCAN + ALERT - NOAA Weather Scan will automatically scan through 10 available weather (WX) band channels and locks onto the strongest weather channel to alert you of severe weather updates. NOAA Weather Alert will sound an alarm indicating that there is a risk of severe weather in your area. AM/PM radio is also available. CHARGE EXTERNAL DEVICES - Quickly charge your portable devices (cell phones, tablets, etc.) using the USB charging cable (included). LARGE LCD DISPLAY - The LCD display is backlit and can show radio station, time, or weather channels. 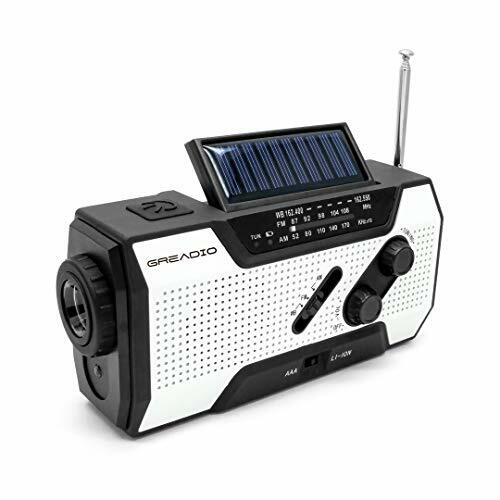 MULTIPLE POWER SOURCES - The ER310 features 3 sustainable power sources to recharge your radio: Solar Panel, Hand Crank, & Rechargeable 2600 mAh Battery. SOLAR PANEL - Simply recharge the internal lithium ion battery with direct sunlight. 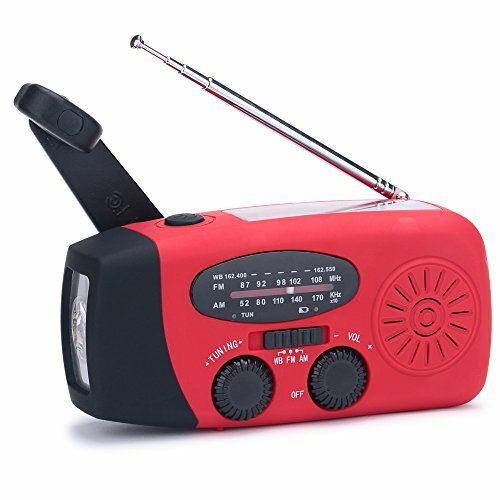 HAND CRANK - Recharge the radio during a power outage or anytime away from a power source. 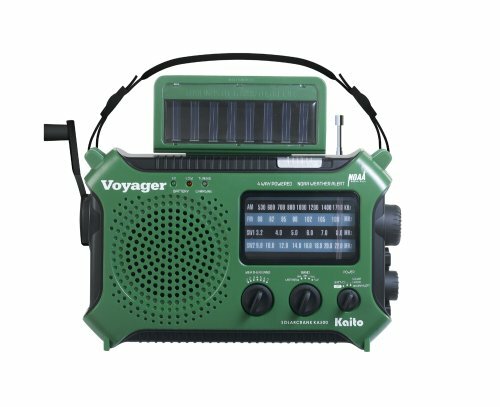 RECHARGEABLE 2600 mAh BATTERY - The rechargeable & replaceable long life battery provides up to 32 hours of radio operation. The ER310 can also be powered by 6 "AA" Batteries (Not Included) as a backup power solution. NOAA WEATHER SCAN + ALERT - NOAA Weather Scan will automatically scan through 7 available weather (WX) band channels and locks onto the strongest weather channel to alert you of severe weather updates. NOAA Weather Alert will sound an alarm indicating that there is a risk of severe weather in your area. AM/FM radio is also available. ULTRASONIC DOG WHISTLE - Use the dog whistle to assist search and rescue teams in locating individuals during an emergency situation. 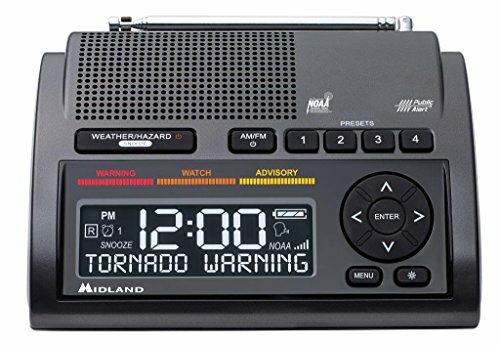 A Must For Emergency: Keep your household prepared with this AM/FM & NOAA weather alert radio, broadcast emergency weather alerts for your area such as hurricanes, tornadoes and severe storms. Table Lamp & 1W LED Flashlight: It can be used in emergency and survival situations to light up dark spaces and areas or to keep your room nice and bright after a storm cuts off your power. 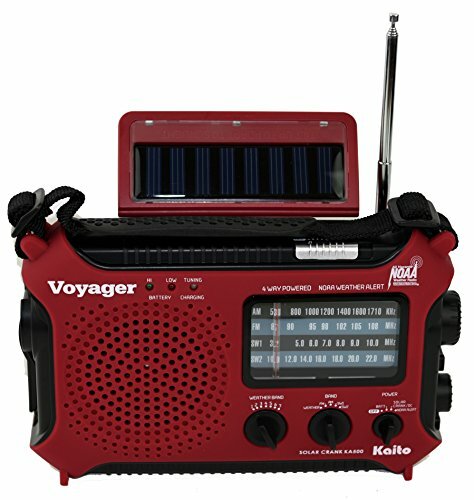 Hand Crank Self-charge for Outage: 2000mAh rechargeable battery provides up to 12 hours of light or 4-6 hours of radio time. SOS Alarm With Flashing Red Light: Ask for help in case you have an emergency or you want to warn somebody. Multiple Ways to Charge: Hand crank, solar charging, Micro USB cable and 3 AAA batteries(not included). It can be charge USB port devices such as smart phones, to keep you connected and powered. √ EMERGENCY WEATHER RADIO: Full coverage of AM/FM/7 pre-programmed NOAA Weather channels keep you staying aware of the latest weather and all hazard information. Radio antenna extends up to 14.5" for high sensitivity signal reception, long range reception will have you connected anywhere at anytime. √ STRONG & EVERLASTING BETTERY: 4 charging ways and a built-in 2200mAh rechargeable battery are impeccable in an emergency situation. 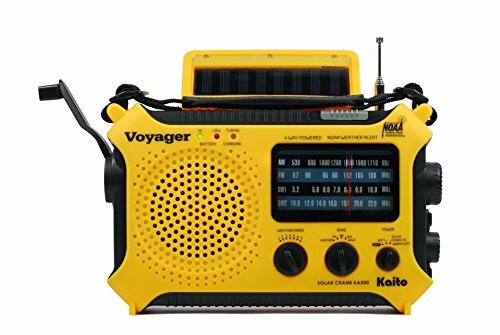 Manual hand crank generator, solar panel, 5V USB input, 3 AAA batteries (not included), supplies up to 12 hours of flashlight time,or 6 hours of broadcast when fully charged. 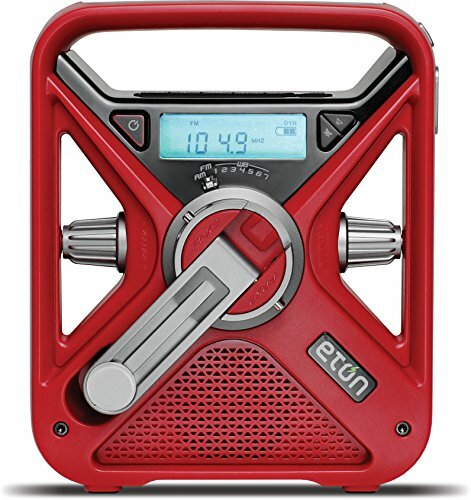 √ ENHANCED HAND CRANK GENERATOR: This emergency radio was made of strong premium ABS material, which is not easy to break,the hand crank is smoother and more convenient. 1 minute hand power generation can support 200 minutes illumination or 10-15 minutes broadcast. √ SOS ALARM WITH FLASHING LIGHT: Compact sized flashlight radio with 1W longer lasting powerful LED can always be with you. Ask for help in case you have an emergency or you want to warn somebody. 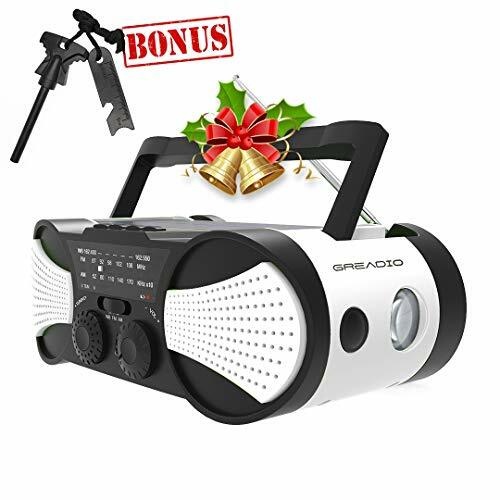 √ 100% MONEY BACK GUARANTY: We are confident with the quality of our emergency radio. If you are not satisfied with it you can send it back with free shipping no questions asked. Bonus Survival Gift: Survival magnesium fire starter, this is the best survival tool you can take with you in your camping & hiking trips, keep in your bag and start fire when you need it. Upgrade to 2000mAh Battery, Can be charged by micro usb port, hand crank and solar panel. Upgrade Speaker and Add Earphone jack, more convenient and better entertainment (Earphone or headphones is not included). Upgrade Charging System, you will know CHARGING PROGRESS anytime via charging indicator light. Upgrade Led Flashlight, brighter than 90% solar radios. Compact Medium size for USA people. 5.7*2.7*2.2 inch (145*68*55mm). Idea for home, bedroom, car, truck, camping, hiking, patio and garden. From 2015 to 2018, iRonsnow has helped more than 300,000 USA people to live through the hurricane season and snowstorm season. iRonsnow Official focus on making emergency equipment. Your creditable emergency expert. 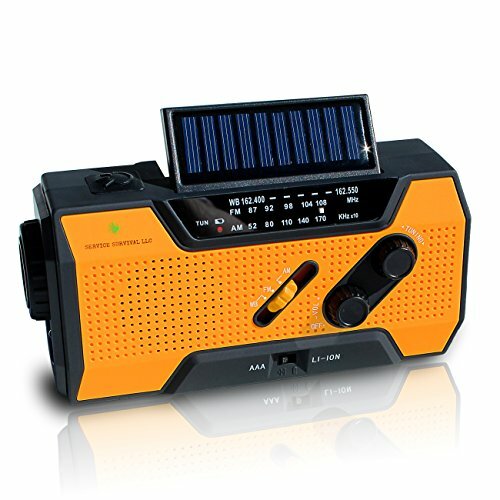 It is used as a Emergency Weather radio, can't work as a professional solar power bank. 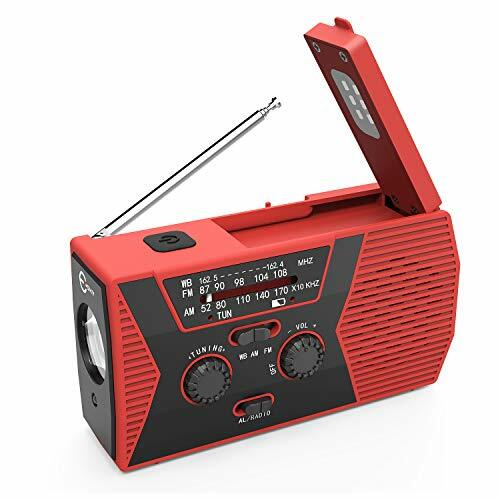 A Must for Emergency: Add this AM/FM & NOAA weather radio to your emergency supply bag to get you and your family well-prepared before a disastrous hurricane, tropical storm or tornadoes. There's also an eye-catching SOS alert with flashing light to ask for help if things get really hairy. More Than A Radio: Perfect for after dark disasters. 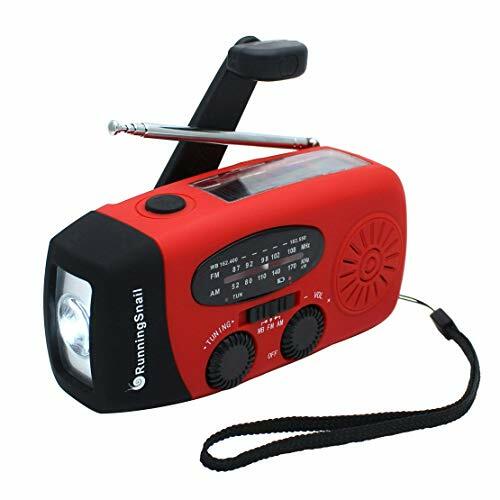 This emergency radio has an ultra-bright flashlight, which can be with you in camping, backpacking, hiking or any other outdoor activities. Works as a power bank to quickly boost your mobile phone during a power outage - Always keeps you in touch. Multiple Charging Options: 3 charging ways and a powerful 2000mAh rechargeable battery are impeccable in an emergency situation. 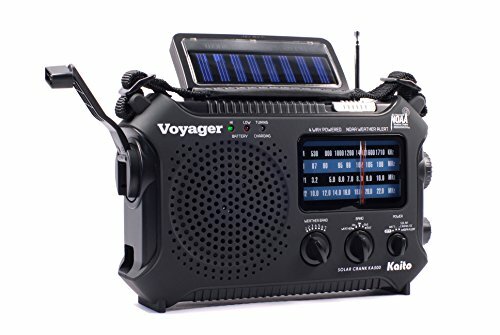 Can be powered by a micro USB charging cable, solar panel, and manual hand crank, this radio with a full charge can last up to 12-H illumination or 6-H broadcast. 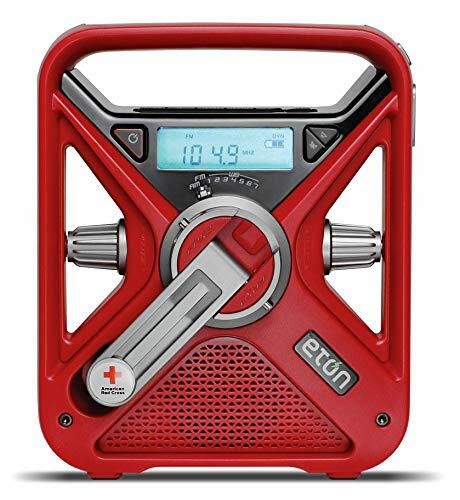 Built to Last: This Esky emergency radio's rugged design is both durable and water-resistant, and can even stand up a drop onto a hard surface, making it an essential and practical emergency survival kit during a natural disaster. 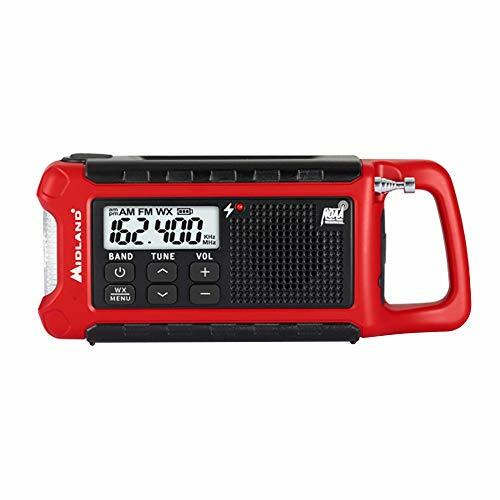 On-the-go Use: This weather radio is a hassle-free way to listen to important weather or news updates. Keep it in your trunk, your suitcase, or carry it by hand with the attached lanyard. Very compact,Portable， light Dimensions: 5.7*2.7*2.2 inch (145*68*55mm)" .Weight: less than 295g . 1 Year Free Warranty, lifetime customer support. 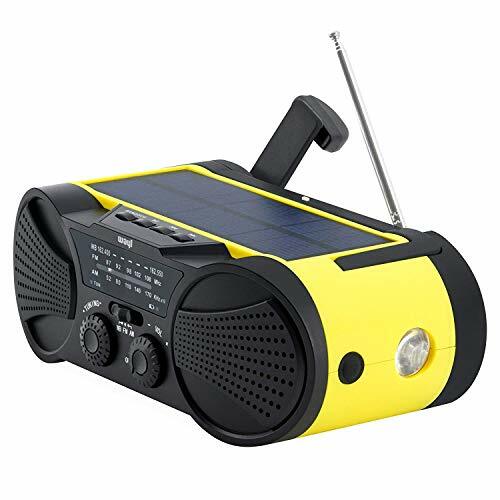 4000mAh GREEOUS hurricane radio extends features with Extremes in Mind:Solar/battery powered(AAA size),Hand crank(wind up radio),SOS alert and cellphone charger.Flashlight/Reading lamp.Music Player. Bring Electronics Back to Life: Emergency radio Charger for iPhone 6 from 5% to 37% in about 15-20 minutes.3w LED flashlight+90liumin reading lamp, The little radio never let the dark get you down. Weather Radio :7 NOAA/AM /FM. 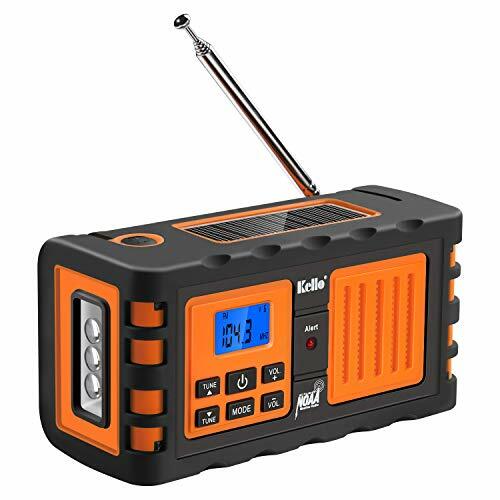 24/7 coverage of weather stations.the Emergency radio has Good Reception on bad storm.Waterproof level:IPX3(Do not soak in water).Loud sound and clear. Easy tuning. Music Speaker:470g/1lb.Portable.Supported micro TF card/USB Flash Disk.35mm headphone jack.Good speakers for camping/Hiking/Family Party. 4 Rechargeable Ways: AAA size battery,Micro USB charging,solar powered, hand crank to wind up the internal battery.If you have any question,We will reply within 3 hours by Email. 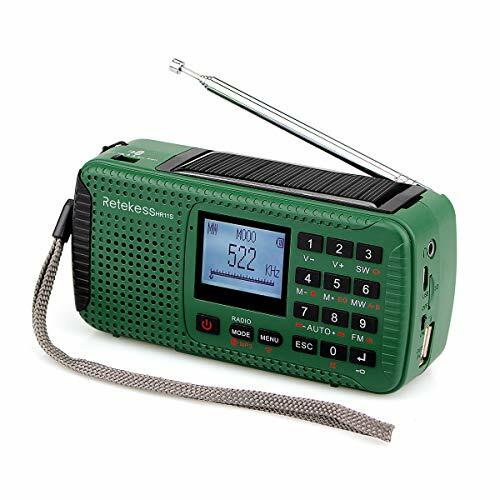 READY FOR ALL EMERGENCIES: This Q9 weather emergency radio is a versatile product, which will broadcast the latest weather and hazard information for your area in time, such as earthquake, hurricane, tornado, blizzard, or any other natural disaster. Using FM, AM and NOAA weather forecast station, you will be able to get the latest emergency news and make the best preparation for it. You can also get the latest weather broadcasting even in non-stormy weather. 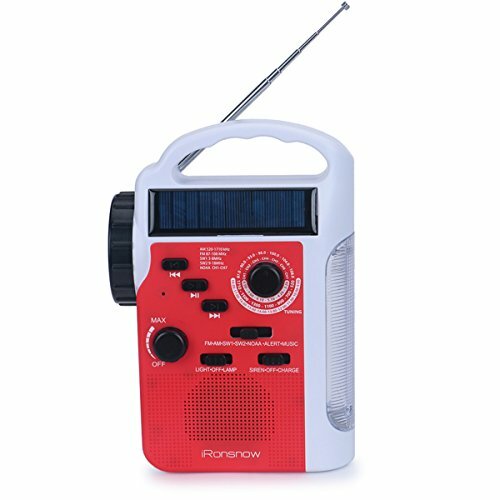 4 WAYS POWERED EMERGENCY RADIO: This emergency radio can be charged by solar, hand crank,Micro USB cable or 3 * AAA batteries (not included), which makes sure that you can maintain power anytime and anywhere, even if you have a power outage. 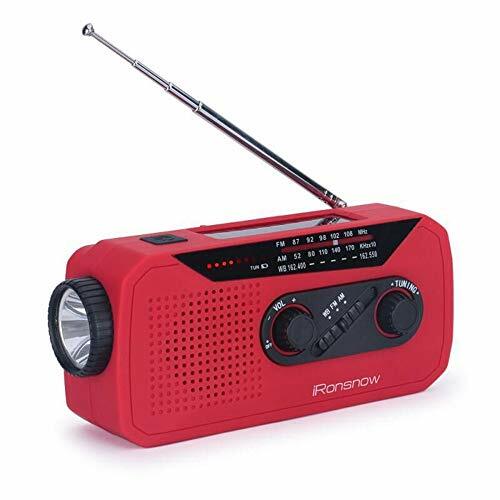 1 minute power generation of hand crank can support 5 minutes of mobile phone calls, 15-20 minutes of flashlight, 15-20 minutes of radio play (medium volume). Ezbnb Q9 can also charge your smartphone and iPad as a 2300mAh power bank. FLASHLIGHT AND SOS ALARM: 5 adjustable modes: strong, medium, low, flash and SOS. With this high-lumen LED flashlight we can illuminate dark spaces and make it bright in case of emergency or power outage during hurricane. In case of emergency, you can also switch it to SOS mode, the LED will be flashing, and the speaker will make a warning sound. LATEST DESIGN IN 2018: Light & sturdy; multifunctional: flashlight/ radio/ power bank; comes with a compass lanyard and a headphone jack, you can listen with headphones. 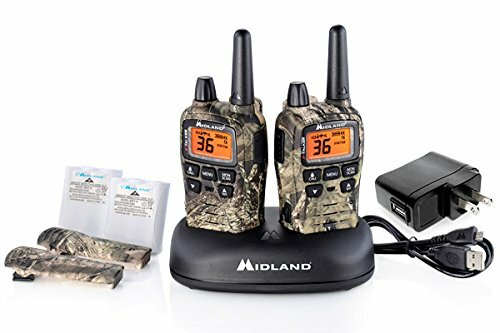 Q9 weather radio is ideal for outdoor activities, such as camping, hiking, kayaking, etc. 12-MONTHS WORRY-FREE WARRANTY: We provide a 100% refund guarantee and friendly customer service. If you are not satisfied with the product or have any question about the product, you can contact us for a refund or a new one. We are very confident about the quality of our product. [2000MAH POWER BANK WILL KEEP DEVICES POWERED] FosPower's emergency radio incorporates a 2000mAh power bank capable of providing emergency power to any small tablet or phone. 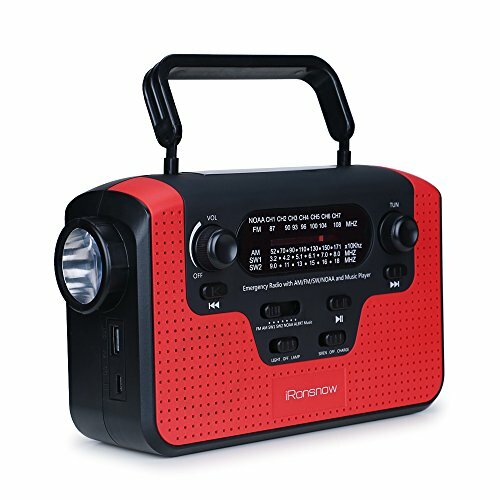 [3 POWER SOURCES POWER WHEN YOU NEED IT] Use the emergency weather radio's 3 power sources when you need a boost of power or need to recharge the radio. 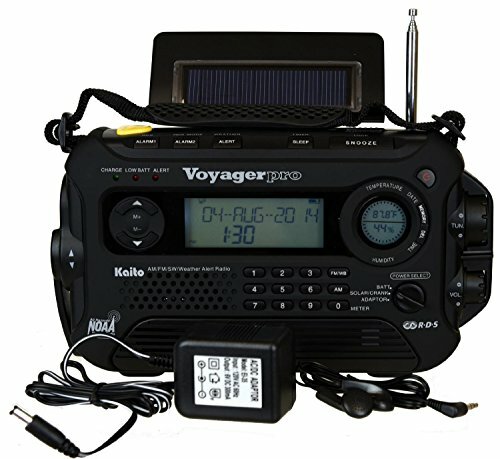 The radio's crank lever and solar panel are both capable of regenerating enough power to keep the radio, lights, and SOS alarm ready to go when you need it most. AAA Batteries ensure you have power when not able to regenerate power. 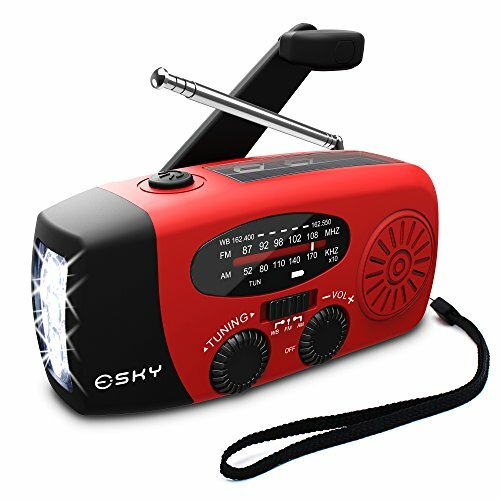 [2 LIGHT SOURCES ALWAYS POWERED] The emergency crank radio can also provide light. The 4 LED reading light and 1W flashlight provides enough output to keep you and your loved ones out of the dark in an emergency situation. [NOAA EMERGENCY WEATHER BROADCAST ACCESS] The radio will dependably receive up to the second emergency weather forecasts and emergency news broadcasts from NOAA and AM/FM stations. 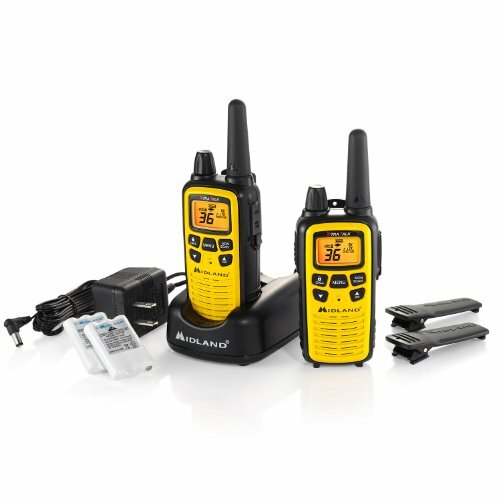 Be prepared with one of the largest capacity rechargeable LI-ION batteries of all weather radios. At 4000mAh, the Buzz4000 extends many of the survival radios features for long lasting use when there is no power indoors or outdoors. Add to your emergency kit, survival kit and hurricane supplies, hiking or camping accessories, and enjoy anywhere on the go. Listen to 7 NOAA weather stations for 24/7 coverage of weather / hurricane / tornado / disaster / emergency broadcasts - as well as to any local AM / FM radio stations. Up to 12 hours of playtime on a full charge. 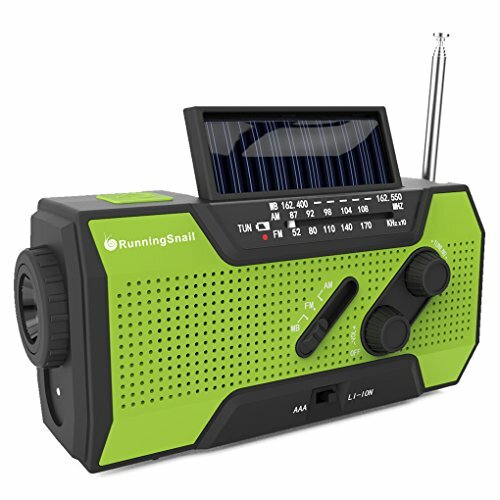 Always ready - power the portable radio 4 ways: through solar power, Micro USB (to a wall outlet or car), hand crank or battery operated AAA batteries (not included). Charge your smart phone or device through a dedicated USB port in case of a power outage. 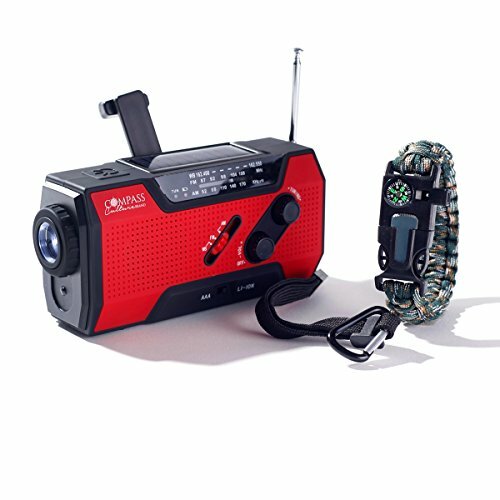 Additional features include an LED emergency flashlight, LED reading light, dual speakers, SOS alarm, headphone jack, MP3 USB player port, MP3 TF Port, folding radio handle, and is water resistant. Backed by a 1 Year Warranty, 30 Day Money Back Guarantee & 100% Satisfaction Guarantee. Important: Please be sure to switch to LI-ION mode (bottom of the radio) after you receive your radio. If you only hear light static/silence from all stations, press the Band/SOS button to make sure the radio is switched to bands. Contact us for further assistance. Storm Ahead, Safe Behind: To stay safe during tornadoes, hurricanes, AM/FM/7 NOAA Weather channels keep you staying aware of weather conditions, knowing the best places to shelter both indoors and outdoors, and always protect your head. A MUST HAVE FOR AN EMERGENCY ! 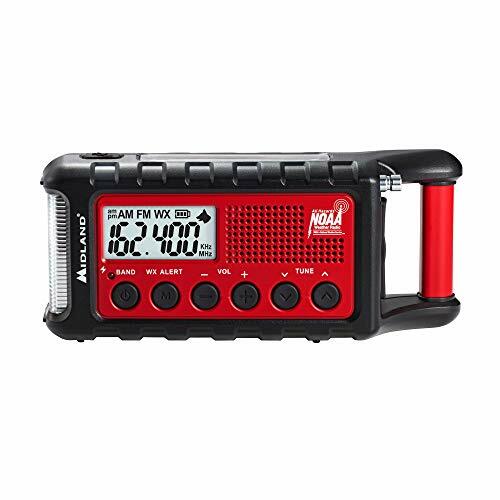 If you live in a state where hurricanes, tropical storms or tornadoes can strike at any time or you just want to be prepared for a major power outage, this radio is for you ! 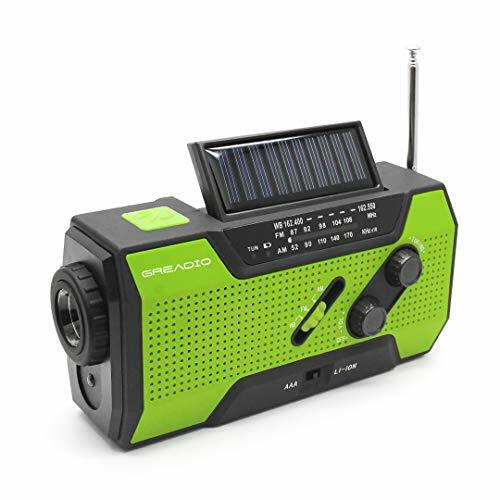 Our Radio has all the survivor features that you need such as NOAA alert radio, smart phone charger ( USB input ), Loud speaker, Flashlight and hand crank charger that will keep you connected all the time ! "You're better off having something for emergencies than wishing for it when an emergency situation arises"
COMPACT AND EAST TO CARRY - Good things come in small packages! The problem with other emergency radios is that they are too big and clumsy. 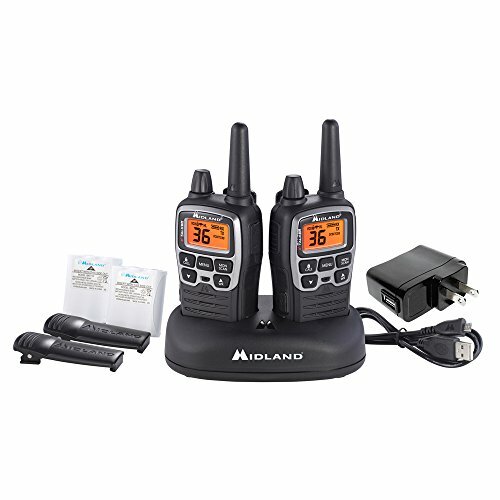 Our Radio is lightweight, portable and just in the right size ! which means that it won't take up much room when you storage it for backup, and you'll be able to carry it around in any bag or purse without even noticing it is there. MULTIPLE CHARGING METHODS IS A BIG PLUS ! charge in 4 ways: Rechargeable 500 mAh Lituim battery, 3 AAA batteries, solar panel and Hand crank - the ultimate charging Method! No matter where you are and for how long, you can always twist the hank crack for a minute or two and use all the radio's features ! 1 minute of Cranking with approximately 130 circles will provide 18 minutes of radio time and 30 minutes of light . That means that You'll never have to worry about running out of power ! combination of sound quality, playback time, and reception. digital tuner that receives radio stations. 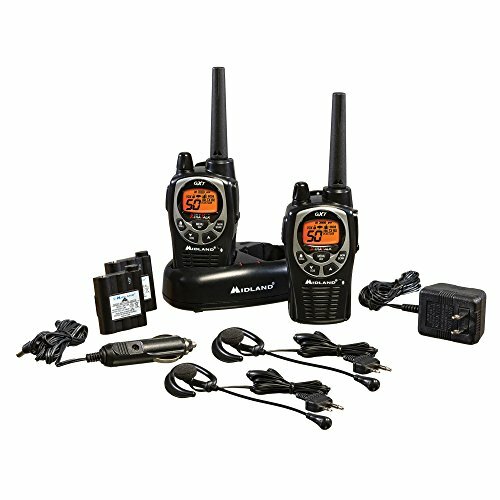 2-WAY RADIO - The 15 Watt MicroMobile walkie talkie is equipped with 15 High/Low Power GMRS channels and 8 Repeater Channels for increased communication range. 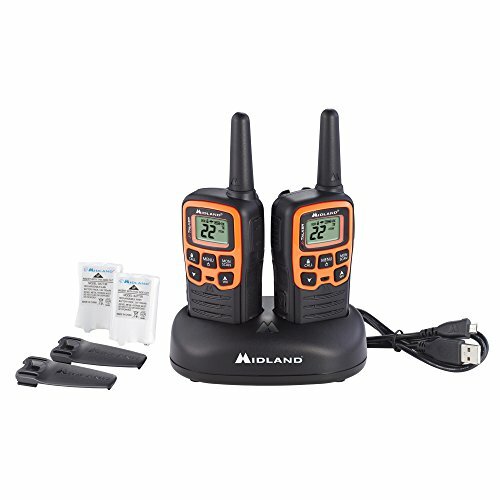 EXTENDED RANGE - The MXT115 features a 50-mile communication range in open areas with little or no obstruction and the MicroMobile's full 15-Watts of power and detachable external magnetic mount mobile antenna offers capability for extended range beyond that of the average GMRS radios. 142 CTCSS/DCS PRIVACY CODES - The MicroMobile has 142 privacy codes that gives you many channel options so unwanted transmissions are not heard. 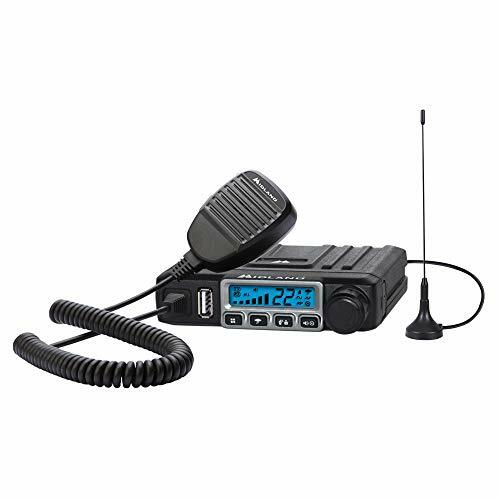 INCLUDED IN THE BOX - MXT115 MicroMobile GMRS 2-Way Radio, flip-frame detachable mount, mounting hardware, detachable antenna with magnetic mount, microphone, microphone holder, 12V power cord with car adapter, quick start guide, and owner's manual. NOAA WEATHER SCAN + ALERT - NOAA Weather Scan will automatically scan through 7 available weather (WX) band channels with flood, tornado, thunderstorm, civil danger warnings, and more. It also locks onto the strongest weather channel to alert you of severe weather updates. NOAA Weather Alert will sound an alarm indicating that there is a risk of severe weather hazards and emergencies in your area. PROGRAMMING - S.A.M.E. - The Specific Area Message Encoding automatically locks on to your county's NOAA weather radio signal requiring minimal programming from the user. CUSTOM - Program your radio to receive weather alerts/warnings from up to 25 different counties and be alerted only when those specific counties are threatened. WARNING SYSTEM OPTIONS - Customize the way that you would like to be alerted: 85 dB siren alarm, voice alert, or visual LED flasher. EMERGENCY POWER BACK UP - The 4 "AA" Alkaline batteries (Not Included) keeps your radio operating during power outages or outside use. ALARM CLOCK - The built-in clock features an alarm with a snooze button and a AM/FM Radio. Wake up to local weather, AM/FM, or buzz. 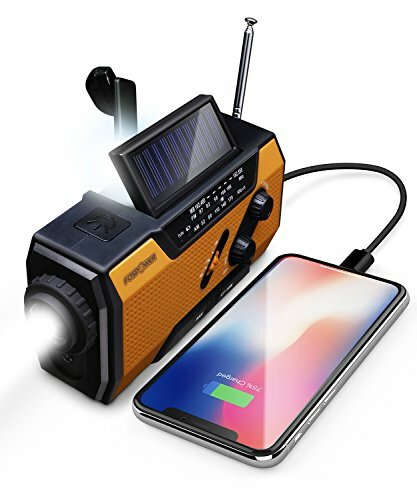 It automatically switches from AM/FM to pertinent all-hazard alerts..
4 WAYS TO CHARGE: This Compact & Light weight Radio, Flash Light & Power Bank can be charged by Solar, Hand Cranked, through USB cable or with 3 AAA batteries (Not Included). 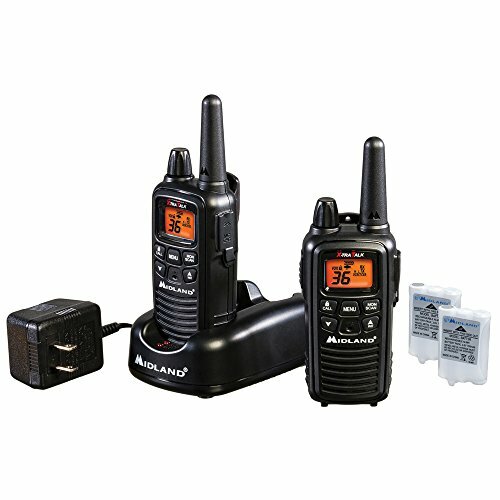 This rechargeable unit provides up to 15 hours of light or 6 hours of radio time depending on charging method. 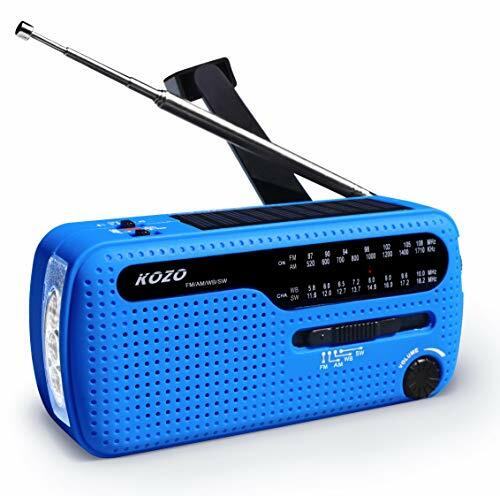 RADIO & TORCH: Emergency NOAA Weather Radio AM/FM/ 7 NOAA Weather Channels keeps you up to date and connected during any situation. The Powerful LED Zoom adjustable flashlight has a Light Intensity 2000Lux@120mm Lighting Time 15 hours, 4 W LED reading lamp & SOS Emergency Alarm with Flashing Red Light gives you that extra peace of mind if you ever need to be found. PREPARE WITH POWER: with 2000 mAh Power Bank you can charge your cell phone in a pinch during emergencies, while camping, or enjoying outdoor activities. Don't get caught unprepared. Get yourself and your loved ones the Compass Culture Brand Solar Crank Radio. Bringing Power To The People! BONUS SURVIVAL TOOL: Survival Paracord Bracelet w/ Compass, Whistle, Magnesium Flint Fire Starter & strong quality Paracord; this is the best discrete survival tool you can take with you on all of your camping & hiking trips, keep in your bug out bag or fashionably wear on all your travels!